With its exploration of walking as a transversal method for knowing, sensing and changing the realities of local communities, the first edition of the “International Summer School of Arts and Sciences for Sustainability in Social transformation” (Gabrovo, Bulgaria, August 2010) proved an insightful and challenging process for the wide diversity of participants, coming from ASEM and a few other countries. In its contents and in its form, ASSiST was a learning experience, teaching its organizers and participants not to be afraid of complexity. 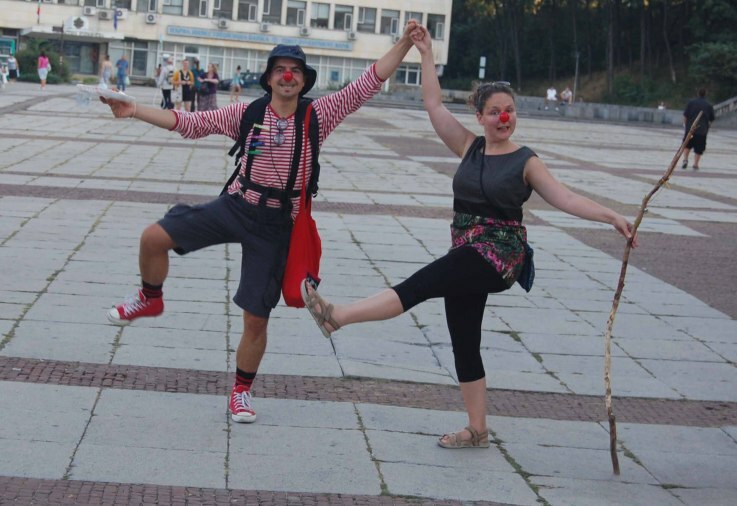 From August 21st to 27th 2010, took place in Gabrovo, a post-industrial city in the center of Bulgaria, the first edition of the International Summer School of Arts and Sciences for Sustainability in Social transformation (ASSiST). This event was supported by the Asia Europe Foundation (ASEF) as a follow-up project of the “Dialogue on Arts, Culture & Climate Change” (Beijing, 2008), and by the Municipality of Gabrovo. It was organized by the Cultura21 international network, Cultura21 Nordic (Copenhagen) and the International Council of Cultural Centers (I3C), in partnership with the Center for the Study of Culture and Society (CSCS) in Bangalore (India), and the Latin-American network of art for social transformation (Red-LATS). The central theme for the first edition of ASSiST was “Walking and Places: building transformations”. There's a lot of “trans-...” in the philosophy of ASSiST: transversal, transformational, and transdisciplinary processes: The transversal is that which cuts across, walks across, different levels of reality, not only bridging them, but also traveling beyond them. Transformation is the reshaping of the form of reality. 'Transdisciplinarity' refers to a transversal unity of knowledge beyond disciplines - whether scientific, artistic or professional, which is not a universalist, reductionist or holistic unity but a complex unity, i.e. a unity where interconnections are sought but also where differences, ambivalences and contexts are recognized. It represents a further step, next to, and beyond interdisciplinary exchange. Interdisciplinarity remains valuable and necessary, with its mutual inspirations between areas of knowledge and practice. The main theme for the first edition of ASSiST, allowed both to highlight the importance of socially transformational practices in community cultural centers, and to explore the transdisciplinary methodological insights brought by walking, as practiced across the arts and sciences. Walking is not only an everyday practice characterizing the human being, but also a very rich form of “action research”, i.e. of knowing by doing: Walking allows embodied learning, i.e. not only the abstract, disembodied learning of the classroom and the schoolbook. Walking-based practices put things learned in contexts, locally and ecologically, embedded in a real geography and not only conveniently virtual. Thanks to the slower rhythm, the walker heightens his or her attention. Walking across places involves moving, exchanging, comparing, and thus constitutes a potentially transversal, transdisciplinary practice. Walking is also sometimes a social and political practice, reshaping the realities of shared spaces and the fiction of public space, accompanying political expressions and the articulation of democracies, as Gandhi's famous “Salt march to Dandi” illustrated. Walking allows both exchanges with multiple others and personal introspection for oneself. Finally, walking is an ordinary activity, low-tech rather than high-tech, accessible to all, and open to non elite-wisdoms from all human groups. Among the workshops conducted at ASSiST were several walks organized by the artists David Haley (alongside the river around which the city of Gabrovo was built – see his workshop blog and his article in Cultura21's webmagazine on walking as an ecological practice), Barbara Lounder (in a field, with blindfolds and walking sticks, in couples and in groups - see her workshop blog), Laurent Malone (from a former factory to the city, talking, singing and dancing with former workers of that factory - see his workshop blog) and Insa Winkler (up a mountain forest, to an orthodox monastery - see her workshop blog). A workshop conducted by the CSCS researcher P. Rhadika, explored the political, social and cultural significance of legal issues around the uses of pavements in the city of Bangalore (see Rhadika's article in the webmagazine of Cultura21 and her workshop blog on the ASSiST website). There were also several semi-open space sessions where participants discussed their insights, experiences and ideas, as well as some theoretical inputs, presentations and diverse evening activities at Gabrovo's “Bread House”. Several participants offered impromptu events that were fitted into the program as best as possible (e.g. a Cambodian dance warm-up at 7am by Leang Seckon). A young artist from Australia, Lucy Ridsdale, wrote an article in Cultura21's webmagazine in which she reflects on how the extra-curricular activities at ASSiST also contributed to fostering a “literacy of complexity” among participants. She writes: “We must learn to not be afraid of complexity. If there’s one phrase that would sum up the intention, preparation for and delivery of the summer school program that would be it. Complexity was a topic we kept circling around and was a principle embodied in everything we did, including, as I see now in hindsight, the dancing, debating, drinking and drifting we did together outside of the programmed activities.” Back home, Lucy is now on a long-distance (1000 km) walk on the Bibbulmum Track in Western Australia. Cultivating a sensibility to the dynamic webs of iterative processes, implies a specific attitude which, in the English language, is attached to a beautiful word: “Serendipity” (from 'Serendip', an ancient name for Sri Lanka). Serendipity is an openness to the burgeoning of the unexpected, and a propensity to assist and foster the blossoming of these burgeons, i.e. processes of cultural transformation. At ASSiST, serendipity found a place alongside purposeful exploration, and intuition found a place alongside rational thinking. This is a dynamic and fragile balance that has to be reconstructed in each single geographical context, according to the specific natural and cultural complexities of the places where each of us is living. Therefore, there is no straightforward “recipe” to be written from the first edition of ASSiST. Let's learn together, not to be afraid of complexity. In its first edition, the summer school ASSiST demonstrated the relevance and richness of walking as action-research for cultures of social and ecological transformation. Walking in different contexts across the natural and cultural webs of meanings of the city of Gabrovo, the participants raised their sensibilities and interests in complexity, being involved, body and soul, in an intense, challenging learning process that lasted seven days. Upon their return to their respective countries, whether in Cambodia, India, Indonesia, Greece, Portugal, Bulgaria, New Zealand, Canada or Brazil (to name only a few) the participants started reflecting and embedding the insights from Gabrovo, in their own work at home. This process is still underway. Besides, a second edition of ASSiST is expected for 2012 at the earliest, with the CSCS and the artists collective KHOJ (Delhi) as its probable hosting partners. Research Associate at the Institute of Cultural Theory, Research and the Arts (IKKK), Leuphana University Lüneburg, and Founding Coordinator of Cultura21 International, “cultural fieldworks for sustainability”, Sacha Kagan is the founding director of the summer school 'ASSiST'. He conducts projects across the academic and artistic worlds. Among his publications are Sustainability: a new frontier for the arts and cultures (Eds. Kagan and Kirchberg, VAS, 2008 - more info) and Sustainability in Karamoja? Rethinking the terms of global sustainability in a crisis region of Africa (Eds. Knaute and Kagan, Köppe, 2009 – more info). Fore more info: personal blog.